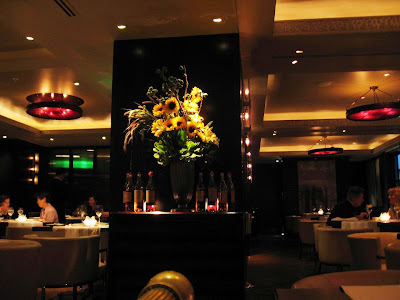 This Michelin starred restaurant in the heart of San Francisco's theater district is one long narrow room - albeit one that has been tastefully converted to give a fun, clubby feel. 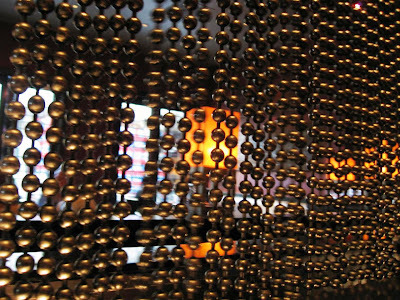 The lights fashioned out of colored spheres that are suspended from metal tubes would certainly appeal to an art-lover. The restaurant is more lively than the Fifth Floor where I had dined only a day earlier. 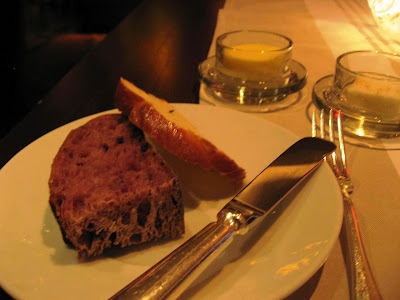 The bar area and the main restaurant were located in the same area which made for a higher decibel level. I actually like that when I am dining alone! 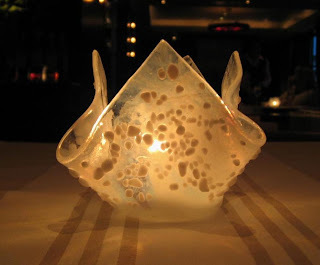 Given its star rating, the items on the menu seemed priced very modestly; even the chef's tasting menu was a steal. 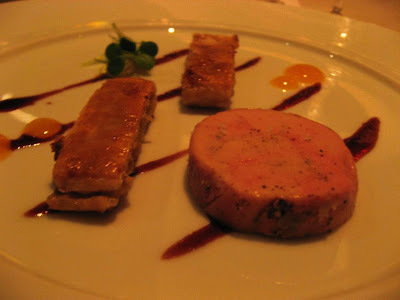 However, the tasting menu is only available Monday through Thursday, so I picked the special Dine About Town menu. 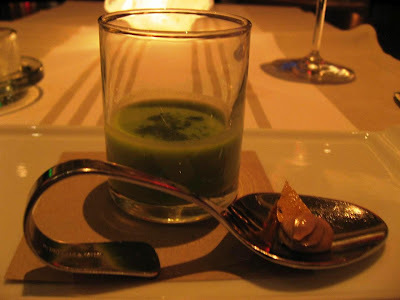 They got me going with a combination of amuse bouches: a spoonful of something delicious and sweet - can't remember what it consisted of - and a shot glass of hot potato soup which was absolutely brilliant. That also set the tone for the rest of the evening. While the service quality was nothing remarkable, the food certainly beats Fifth Floor hands down based on my recent dinner at both. 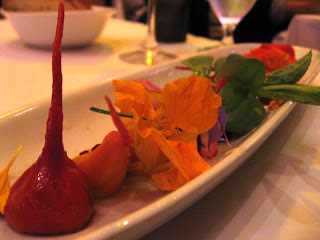 The Slow Roasted Baby Beets & Burrata was a work of art with micro-greens and edible blossoms adorning this dish. The beets were juicy and flavorful while the burrata - an Italian cheese made of mozzarella and cream - was fresh and equally delicious. 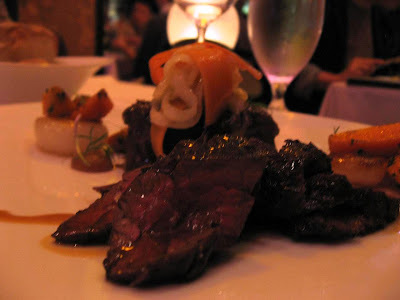 My main course was a Duo of Niman Ranch Beef containing a bavette steak and braised cheek, glazed Thumbelina carrots, caramelized onions, date puree and lemon jus. The beef was heavenly, and melted in the mouth. The flavorful, glazed onions were mouth watering good too. 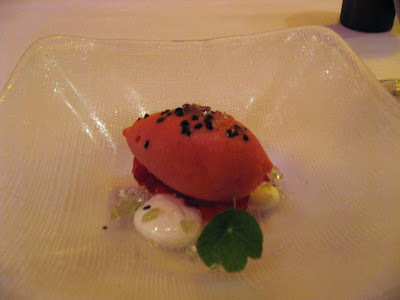 I ended with the Strawberry Sorbet with basil candy, lemon verbena creme fraiche and Hawaiian black sea salt. This was amazing stuff too, and the sea salt made it particularly delectable. 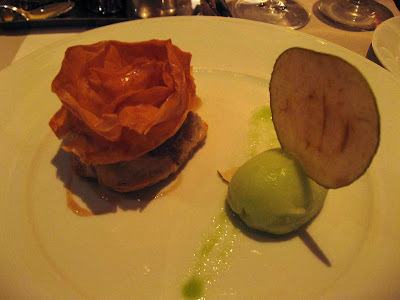 This restaurant definitely merits a repeat visit! 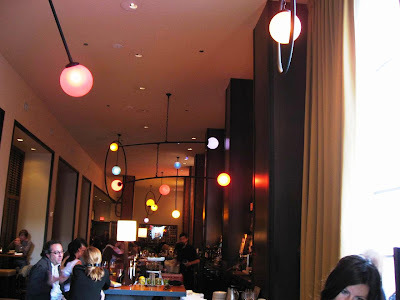 Cortez is ensconced in the Hotel Adagio and its kitchen is overseen by chef Jenn Puccio. The stroll back to my hotel past Union Square did me some good too. There was a nip in the air, but it was pleasant. I also noticed the large Virgin Megastore seems to have closed down - the economic downturn continues to take its toll. I have reviewed Roy's of San Francisco once before. 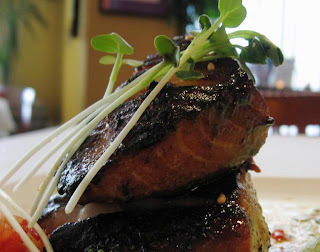 Part of the culinary empire run by chef Roy Yamaguchi, this restaurant serves up excellent Hawaiian fusion fare in classy and elegant surroundings. I was here with a colleague on one day for a lunch meeting; I came back the next day, this time armed with my camera. The entire staff is very prompt, helpful and friendly. The food continues to be wonderful, but what makes even a quick lunch special is the importance they attach to the presentation even during these busy hours. 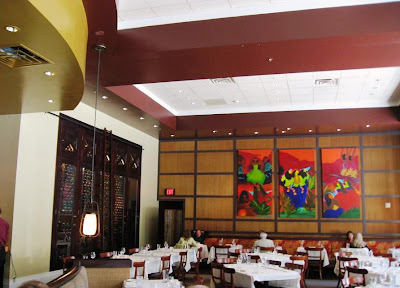 The Roy's Power Lunch Prix Fixe is a great way to try this place. I started with a miso soup, Waimanalo mixed greens and Lumpia. The Lumpia, which is a kind of spring-roll is popular in Indonesia and the Philippines, was actually pretty good. I liked this better than the Pot Stickers I had ordered for my appetizer the day before. 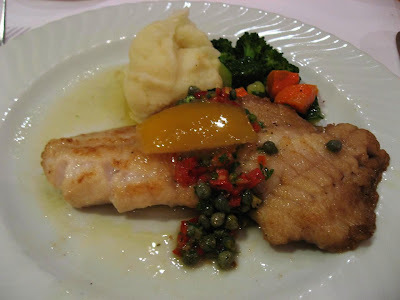 The Butterfish I ordered for my main course was excellent! It was obvious how the fish got its name - every morsel was buttery soft and went rather well with the Japanese inspired sauce and the beans and other greens. Since I had a better appetite and there were no meetings to run off to, I did order a dessert this time. 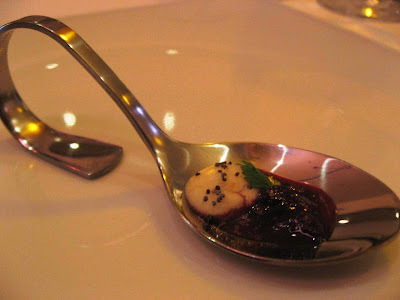 The creme brulee was good, but the carmelizing process had ended up warming most of the custard. 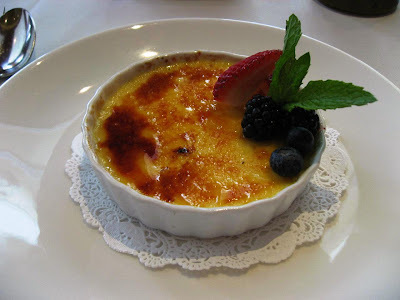 The best creme brulee provides an appealing contrast between the cold custard and warm top layer (among other things!). 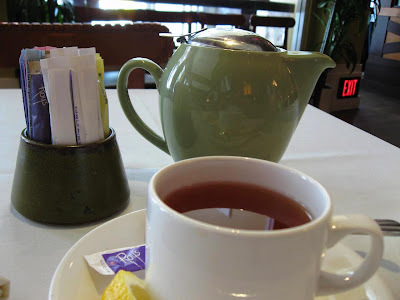 A cup of Earl Grey and I was ready to get back to my hotel and begin packing for the long trip home. Apparently, Santana Row is among the highest ranking shopping areas in California and the one that generates the highest sales within the Silicon Valley - in short, a shopper's paradise. 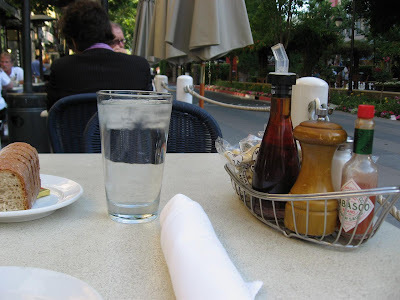 But for me, Santana Row is an ideal destination to de-stress after a long day at work with a stroll in the evening before dining at one of the many wonderful restaurants. 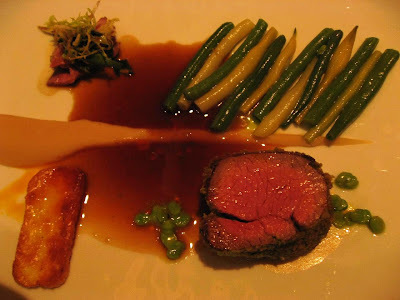 From upscale French dining to Greek, from Chinese Fusion to Californian Seafood, it's all here! Here are some pictures of another such lovely evening when I dined al fresco at the Yankee Pier. 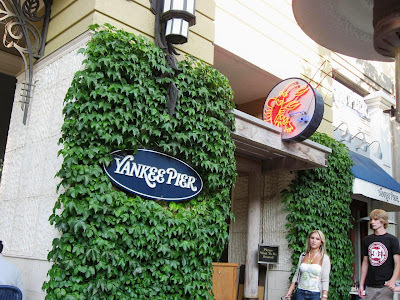 Yankee Pier, a seafood house offers ocean-fresh seafood from coast to coast: From live Maine lobsters, fresh shucked oysters and a array of grilled fresh fish. While they have a large seating area indoors too, I took a seat outside. 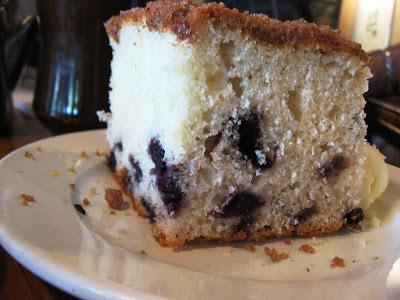 The waitress was a friendly one, chatting at length and making recommendations on the catch of the day and the desserts. 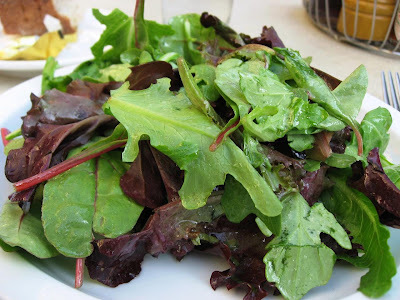 I munched on some salad green while the chef grilled my fish. The tequila bar across the road seemed like a popular place too and was soon crowded as the sky turned a shade of orange in the late evening sun. 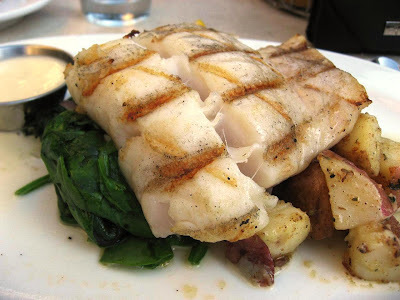 I had decided to go with the mahi-mahi, grilled on a heap of spinach sauteed with onions and a side of potatoes roasted with garlic and olive oil. 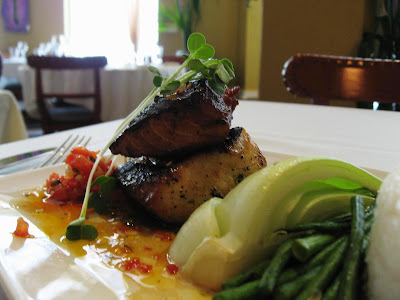 The mahi-mahi is particularly popular in Hawaii from where it gets its name. It is also known as dolphin fish, even though it doesn't really share much with dolphins other than its habit of skimming over the ocean's surface. Anyway, the fish was super fresh and a treat to polish off. 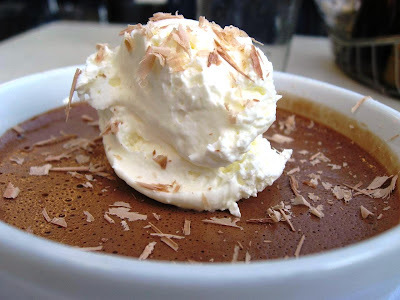 The milk chocolate Pot de Creme with whipped creme fraiche provided a sweet ending to the meal. The waitress was feigned offense when I wouldn't finish it, but I really was too full and had a busy day tomorrow. I watched the daylight fade with a pot of Earl Grey and then reluctantly headed back to my hotel. The evening was very pleasant which ought to be normal, but recently California has been a little fickle with rather cold spells and unseasonal rain. 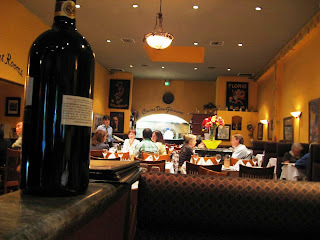 For a slice of Italy right in the middle of Silicon Valley, there is no better than this excellent restaurant in Mountain View's Castro Street. Intricate wood-work, earth-colored walls, high ceilings, antique chandeliers and rows of large bottles of wine give this place a lot of homeliness and warmth. Watching the kitchen at the back with fires ablaze and the chefs hard at work, I knew I had made a wise choice for the evening. 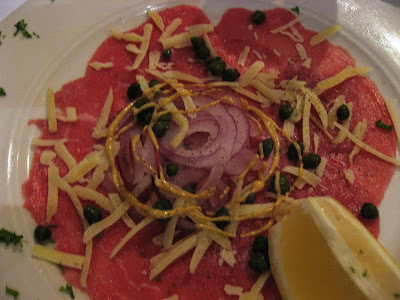 The Carpacchio de Miazo, an appetizer of wafer-thin beef slices which arrived decorated with squiggles of mustard, onion and a lavish topping of capers and shredded Parmesan cheese. A dash of lemon made this a perfect way to begin dinner along with my wine. 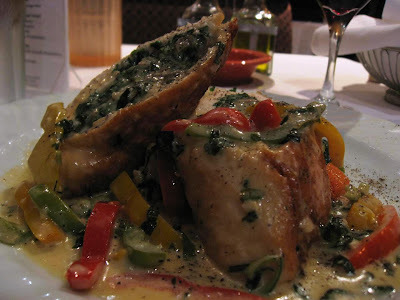 The Pollo Ripieno, made of oven-roasted chicken breast stuffed with herbs, ricotta cheese, roasted sweet peppers was served over garlic mashed potatoes, sauteed swiss chard and roasted pepper cream. 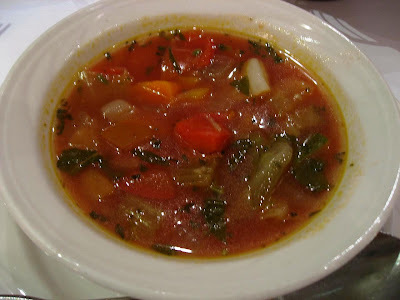 This was excellent too with its rich, pampering flavors that characterizes good Italian food. Later in the week, I came back here for a lunch meeting with a colleague and ordered minestrone soup followed by grilled snapper in a lemon-butter sauce. 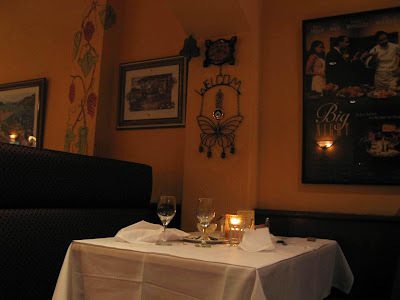 The food was excellent again, but it is the ambiance in late evenings that makes this restaurant special - a great choice for a romantic dinner. 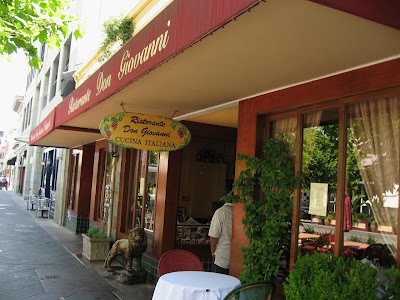 Don Giovanni also scored high on service quality both for lunch and dinner. The menu has many options for the meat and sea-food lover. 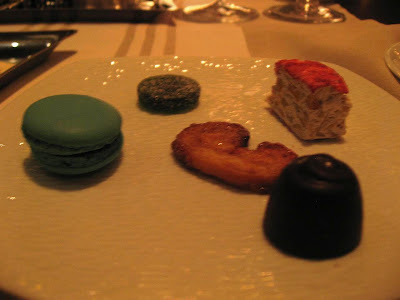 Unfortunately, I didn't have the appetite to try any of the desserts during this time. The Sunday morning brunch at Hobees was terrific like my last time here. This time too, I was meeting an old friend after a long gap. This time too, the highlight was clearly the heavenly blueberry coffee-cake that accompanied my main dish: The Benedicto Siciliano, a creative version of Eggs Benedict with a melange of fresh sweet basil, roma tomatoes and avocado tossed lightly with olive oil and lemon juice atop two poached eggs on a grilled English muffin with a special marinara sauce and Parmesan cheese. 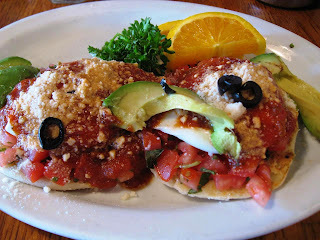 There are few places you can enjoy a better breakfast or weekend brunch than here at Hobees! They have multiple locations in Silicon Valley, but I like the one in Cupertino the most. After that filling brunch, I didn't have the appetite for anything substantive during dinner later. 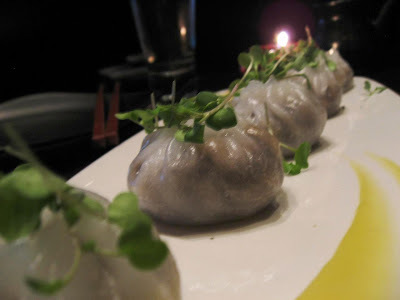 I was meeting with a friend in the vicinity of Santana Row and we decided to try Sino, a Chinese fusion restaurant that opened a couple of years back. 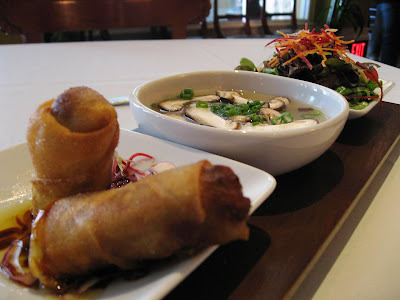 Sino is a creation of Chris Yeo, who also runs the popular Straits Cafe in the Bay Area. Gleaming red walls with a crackled glaze, metallic bead curtains, and colorful bar area makes for a quirky and interesting ambiance. 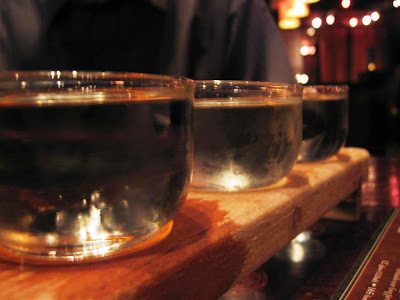 We decided to sample their selection of sakes. Of the three varieties, I particularly liked the flavors of the Cherry Bouquet and Crysanthimum Meadow. We shared a plate of wild mushroom dumplings and followed it with crispy snapper in a spicy pepper garlic sauce with Dan Dan Mien, flat noodles with szechuan peppers, garlic and scallions (and chicken). The dumplings were excellent! 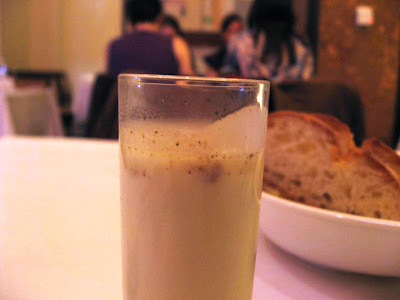 The taste of the mushrooms was enhanced by white truffle oil. 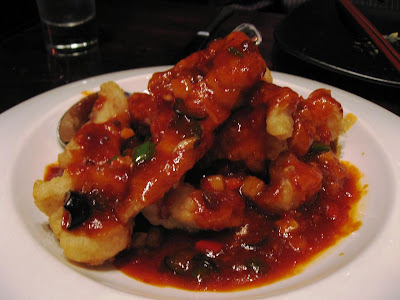 The snapper was lightly batter-fried and had a spicy, tangy sauce. 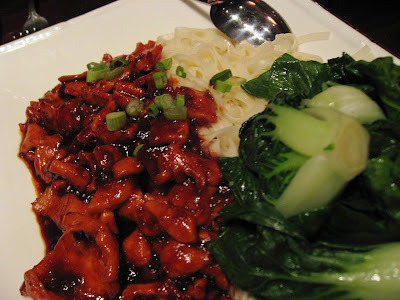 The Dan Dan Mien is usually made of pork, but they were willing to substitute it with chicken for my friend. Pretty spicy stuff, but then I like spicy! 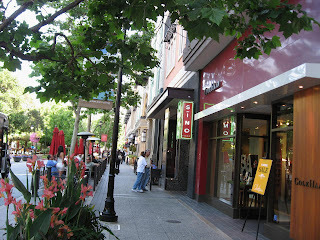 Santana Row is designed to look and feel like the European promenades replete with cafes, pedestrian-friendly sidewalks and store-fronts. This is a great place to stroll around in the evenings, watching people and dining al fresco. Smaller than, but similar to, the wonderful 3rd Street promenade in Santa Monica.